Tiimikuskimme Joel Valander ajoi toisen touring kisansa vuosiin Äänekoskella järjestetyssä Fintrack Touring -osakilpailussa. Ohessa hänen englannin kielinen kisaraporttinsa. Over 30 entries on Modified so I was looking forward to a good race. Track layout was new for everyone in the morning, and traction started out low but came up pretty good for the finals. My main focus has been on offroad this winter season so I didn't had big expectations going into the race. There was two controlled practices, four round of qualifying and three finals. I was running on pretty slow heat on qualifying as there is no re-seed. I did clean runs and improved every round. Viljami Kutvonen TQed every round with his XRAY T4 2018. I lined up second on the grid and Teemu Saarinen third. In finals Viljami was able to pull a gap and I wasn't able to put a pressure on him. Viljami won all three finals. 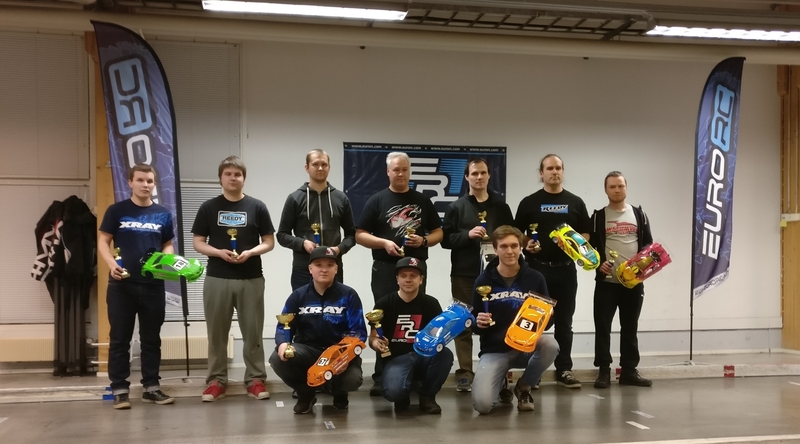 Like Viljami I was also able to pull a gap to drivers behind me and finished safe second in all finals. Georgy Chmigal from Russia was able to finish third from fifth on the grid also with XRAY T4. Xray dominated modified class with TQ and 1-2-3-6-10 finishes. Great teamwork by whole Xray/EuroRC team. I want to say thanks to my sponsors Xray, EuroRC, Hobbywing, Hudy, Highest, EVPeak and T-Shades.